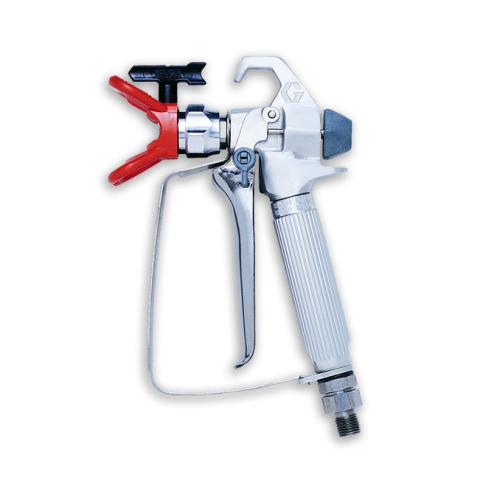 Make quick work of large jobs with this professional-quality paint sprayer. For some residential painting projects, a small hand-held sprayer will do the job, but if you'r looking at a job like painting your house, you'll want a larger electric-powered airless sprayer like the Alessco MP400. 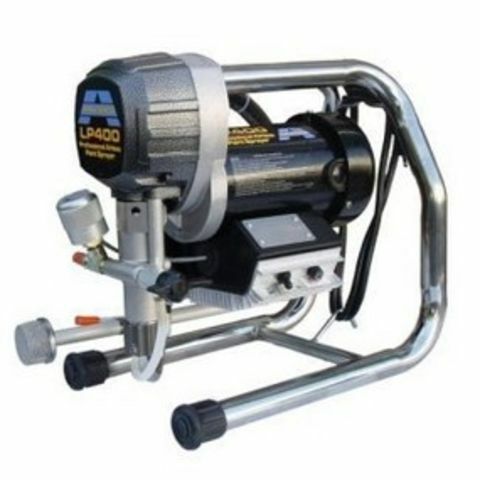 It's small enough to move as you progress through your project, but powerful enough to provide a steady, reliable stream of paint to your paint gun. No -- not unless you want to take the chance on a major clean-up fee if the equipment isn't cleaned to the rental center's standards, which usually means spotless. What size tips should I use on the paint guns? Usually, the rental center staff will talk with you about your project and recommend what size of tip. With that said, using water-based paint, you'll most likely you'll be equipped with .015 and 0.17 tips. Make sure you're using water-based paints -- Many equipment rental yards only will allow their equipment to be used with water-based paints. Why? Because it's a bear to clean up equipment that had been spraying oil-based paints -- and the truth hurts, but rental customers couldn't be relied upon to properly clean the equipment after using oil-based paints. Most home owners today use water-based paints anyway, but just make sure that's what you plan to be using when renting a paint sprayer from an equipment rental shop. Sounds kind of simple, but make sure you've fully completed all of your prep steps before you take on the rental expense. DO: Fastidiously clean any spray equipment immediately after use. DO: Clear the project area of anything you don't want to accidentally paint. The tiny droplets of paint that come out of a spray gun have an incredible ability to land where you don't want them, as much as to effectively cover your paint surface. If you're working indoors, don't just cover furniture in your project area -- move it completely out of the work area. DON'T: Think you're capable of "just painting around things" without accidentally getting paint on them when using an airless paint sprayer. Mask and/or remove anything you don't want painted, and supplant the power equipment with a paint roller in "edgy" areas. DO: Be safe! You might not think there's anything dangerous about a paint sprayer, but paint comes out of the tip so fast it can cut or damage tissue at close range. So never point the tip at anyone, and always wear protective eyewear. Consider using a respirator, particularly in indoor spaces.